Material Cultures in Canada presents the vibrant and diverse field of material culture studies in Canadian literary, artistic, and political contexts today. The first of its kind, this collection features sixteen essays by leading scholars in Canada, each of whom examines a different object of study, including the beaver, geraniums, comics, water, a musical playlist, and the human body. The book’s three sections focus, in turn, on objects that are persistently material, on things whose materiality blends into the immaterial, and on the materials of spaces. Contributors highlight some of the most exciting new developments in the field, such as the emergence of “new materialism,” affect theory, globalization studies, and environmental criticism. 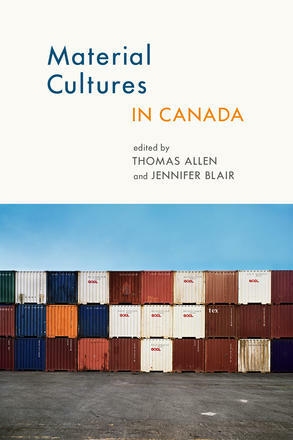 Although the book has a Canadian centre, the majority of its contributors consider objects that cross borders or otherwise resist national affiliation. This collection will be valuable to readers within and outside of Canada who are interested in material culture studies and, in addition, will appeal to anyone interested in the central debates taking place in Canadian political and cultural life today, such as climate change, citizenship, shifts in urban and small-town life, and the persistence of imperialism. Birkwood, M. (2015). Is It Still a Cinch? The Transformational Properties of Objects in Guy Vanderhaeghe's The Last Crossing. In Material Cultures in Canada (pp. 107–127). Wilfred Laurier Press.